April showers bring May flowers but it is also the onset of Earth Day celebrations. Honestly, we should be celebrating Earth Day every day, not just on April 22, 2014. 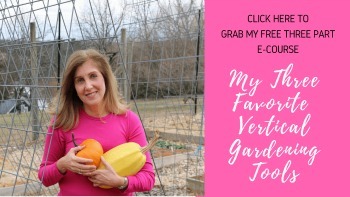 To give you the biggest bang for the buck, Green Sisterhood is celebrating Earth Day the whole month of April with an Instagram challenge, Twitter party with prizes (oh I adore them) and a blog carnival. 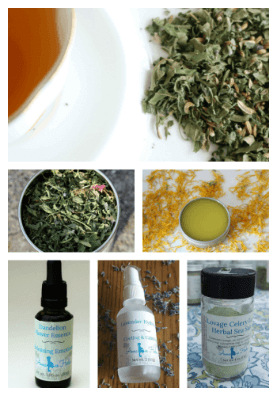 Yeah, Green Sisterhood is pulling out all of the stops! Why? Because we love the Earth as sappy as that might sound. How can you help? Click the phrase below to tweet and share with your followers and join us! JOIN ME IN APRIL FOR EARTH MONTH #EARTHDAYGS CELEBRATION! 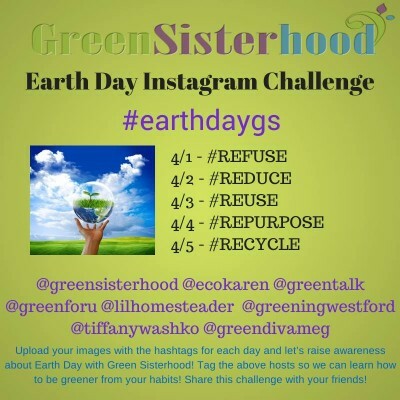 During the week of April 1 through April 5, Green Sisterhood is hosting an Instagram challenge with 7 other green sisters. The theme is the 5 Rs: refuse, reduce, reuse, repurpose, and recycle. If you want to follow or participate use the hashtag (#) each day for the particular challenge as well as #Earthdaygs. Here is my first entry on refuse. I have an issue with energy bars. 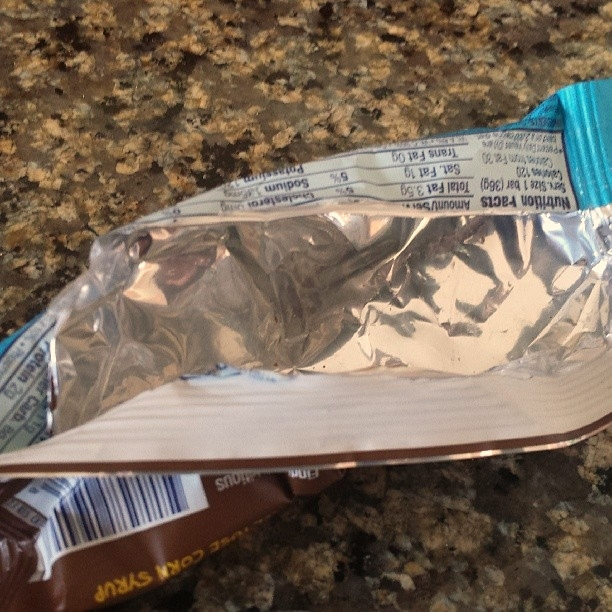 Although I recycled the wrappers with Terracycle I am still creating an energy bar footprint. It take energy to create them and more energy to upcycle them. Plus, most people don’t have access to recycling the wrappers. I bet you have something you want people to refuse buying. So, be sure to tag the following bloggers so your images can be shared among our followers. As much as we love Instagram, we love Twitter more. A Twitter chat is like speed dating where you get to know new people and can win prizes. 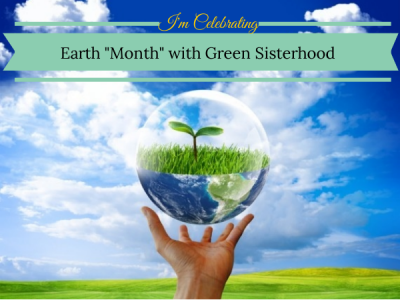 So due to popular demand, Green Sisterhood is back with another Earth Day Twitter party, Thursday, April 3 at 9 PM EST. Prizes include, reusable bags, reusable straws, glass containers, glass water bottles and reusable utensil sets! 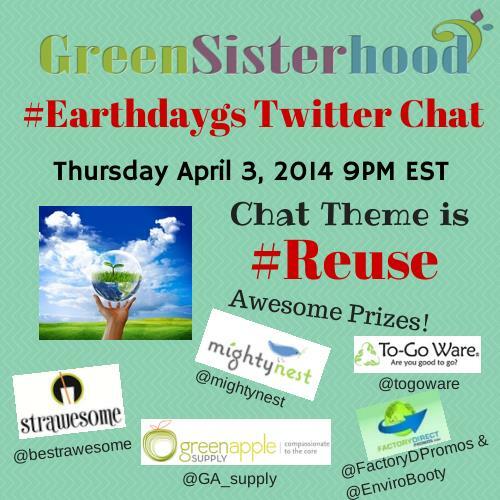 You have to follow @Greensisterhood on Twitter and use#earthdaygs so you can enter to win prizes. Details are below. 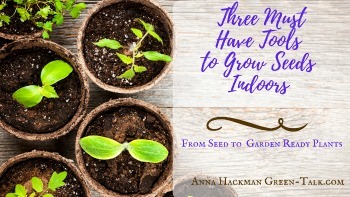 Listed below are the topics that many of the green sisters will be featuring on their blogs. I can tell you–these women are one smart group and I personally learn from them as well. Check the following blogs during the time period to see what they have to say. Be sure to get aboard the Earth Day train with us and participate! Uploaded one image on Instagram today! Cant’ wait to see everyone else’s! I am celebrating Earth Day by “Just Saying No to Drugs” NO MORE KOCH!. The Koch Brothers use their family wealth to support political agendas that are very harmful to the environment, Until the Washington Post piece March 29 on the industries that make up the Koch industrial base I was not aware that I, as a consumer, was actually “giving” to the many causes they support (to the tune of 400 million!). Georgia Pacific (Brawny paper towels & Angel Toilet Paper are two examples of their products), Molex (makes a part that goes into all iPhones), Spandex name brand for Lycra, they own 5% of all oil refining capability of USA, Stainmaster Brand in most carpet products, and Koch AG which sells pesticides to agriculture. I am starting my own personal boycott of all Koch Industries consumer products and I have told my financial advisor to check my retirement portfolio and eliminate any Koch stocks. Good for you! It’s about time we recognized who is hiding behind all of the mess and to boycott them as they deserve!